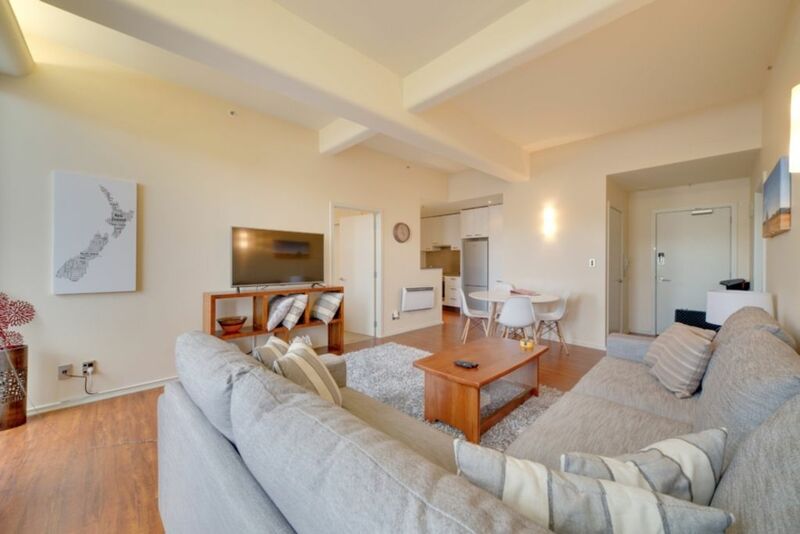 A really nicely presented apartment with ample space for two couples or a couple with children. High ceilings in every room! There are Queen beds in each bedroom and a bathroom with bath / shower. All bedding / towels provided. All kitchen facilities. We have keypad access so you can arrive anytime that is convenient to you. Just metres away from Te Papa, McDonalds across the road 24/7 and a BP. Please note - we have a strict NO PARTY policy in this apartment. Had everything we needed. Comfortable beds. Very clean and well set up. Fantastic location - can’t be beaten! Great location and very central to everything. Great location and very central to everything. No parking. Bedrooms were nice and beds comfy. No sharp knives in the kitchen for food prep. A handle had come off the cupboard and was in the cupboard making it hard to open. There were no tea-towels or bath mat, and we used the toilet mat to get in and out of the over bath shower. No bin liners. The unit felt tired, not well equipped, and it seemed like all the effort was put in the bedrooms and not the rest of the unit. Fantastic location & very comfortable. Fantastic location & very comfortable. Noisy intersection so double glazing would make a huge difference. Shame there hadn't been time to fix a broken light fitting above the bathroom vanity (due to it being a weekend). Issues with the TV/Netflix on Sunday night extremely frustrating - problem satellite dish on roof of the apartment block which only the body Corp could fix. However, that aside would stay again due to location. The property is in a great central location (bit noisy as right above a busy intersection) but it is central city after all. The apartment is great - nice and clean and spacious. Couldn't fault the apartment itself but the failure of basic appliances (ie TV!) and lack of service really put a dampener on our stay here. Great location & awesome apartment.